This is the final Part of a series of 4. I am covering or rather duplicating what was sent to me from Olympus’s Press Releases as I am in not in the position to comment or review the Lenses until I tested it. I am going to share about the 2 new Zuikos in this episode. A long-awaited addition to the M.ZUIKO DIGITAL series of compact lenses — whose outstanding imaging performance is achieved by combining the latest optical technologies with the superior craftsmanship honed over the long history of the legendary ZUIKO lenses — this lens is a single focal length lens with a wide angle of 12mm (equivalent to 24mm of 35mm cameras) and a large aperture of f2.0. In addition to capturing the world with the unique and powerful perspective of the wide-angle lens, this lens also boasts excellent imaging performance, delivering crystal-clear images with high contrast and sharpness throughout the image area. Ideal for both indoor and outdoor shooting, this lens is also provided with the new MSC (Movie & Still Compatible) mechanism that enables fast, quiet autofocusing with both movies and still images. 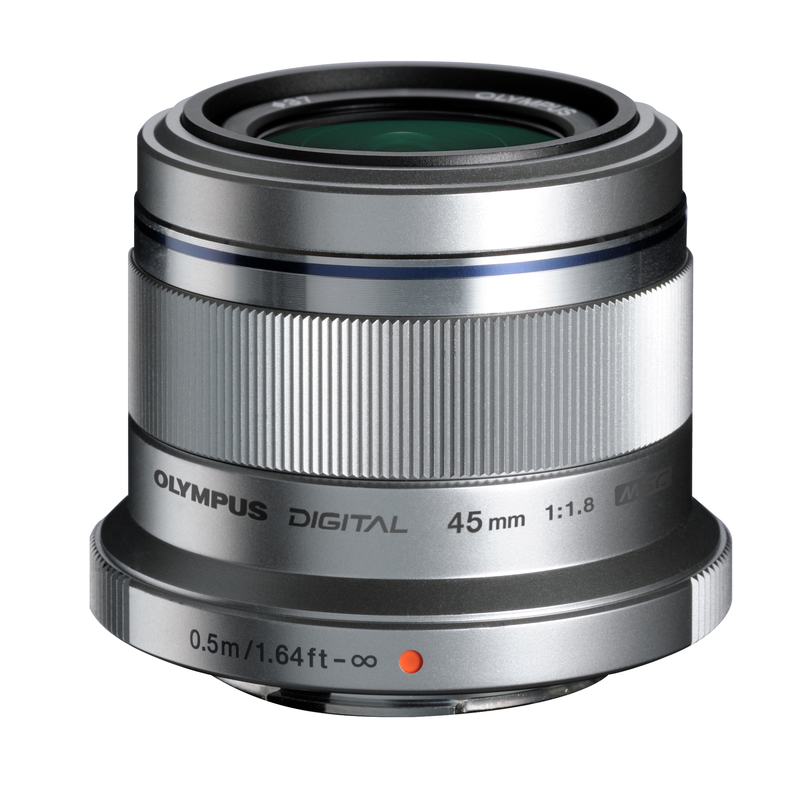 An elegant metallic outer finish gives this lens a classic feel that transcends time when combined with the OLYMPUS PEN E-P3 camera, which will be released simultaneously with the lens. 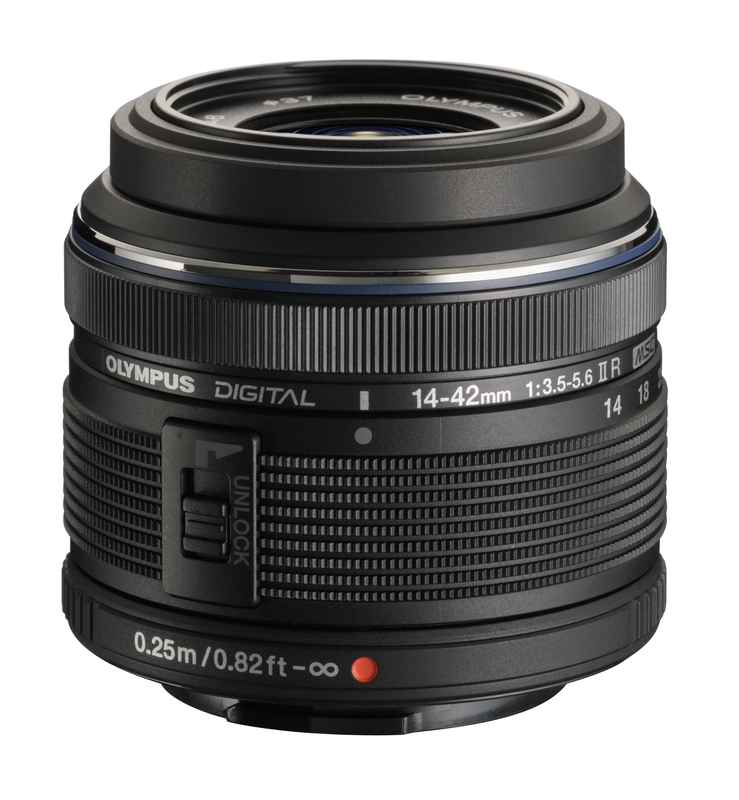 The launch of the M.ZUIKO DIGITAL ED 12mm f2.0 is scheduled for 22nd July, 2011. 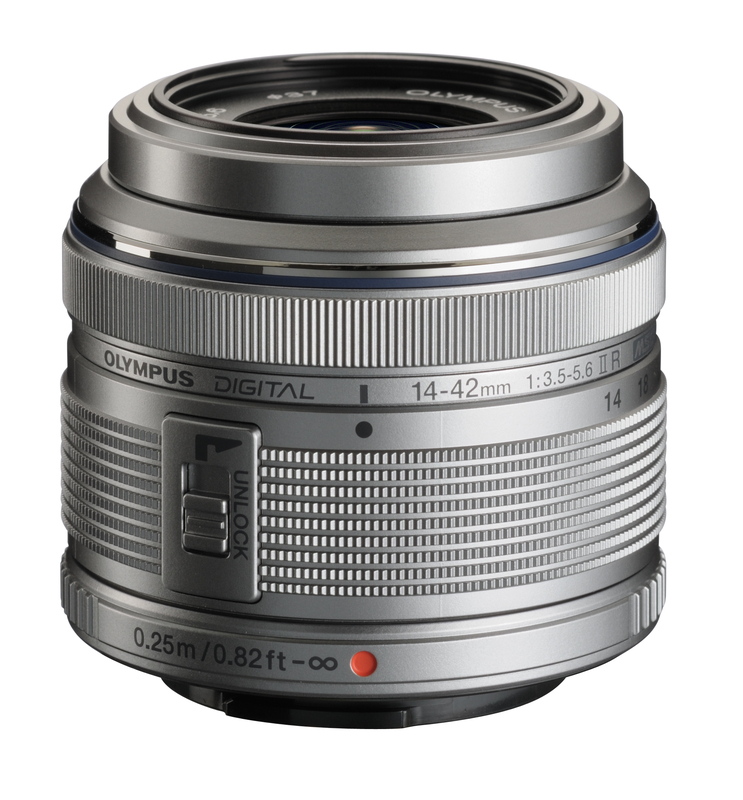 The M.ZUIKO DIGITAL ED 12mm f2.0 is composed of 11 lens elements in 8 groups. These elements include a DSA (Dual Super Aspherical) element that ensures very high accuracy, a Super HR (High Refractive index) element with high spherical aberration correction capability, and an ED (Extra-low Dispersion) element with an excellent chromatic aberration correction effect. The balanced placement of these elements makes it possible for this lens to offer outstanding image quality in a remarkably compact design. Weighing a mere 130 grams, with a maximum diameter of 56 mm and an overall length of just 43 mm, this lens nevertheless provides excellent clarity, contrast and sharpness throughout the image area. 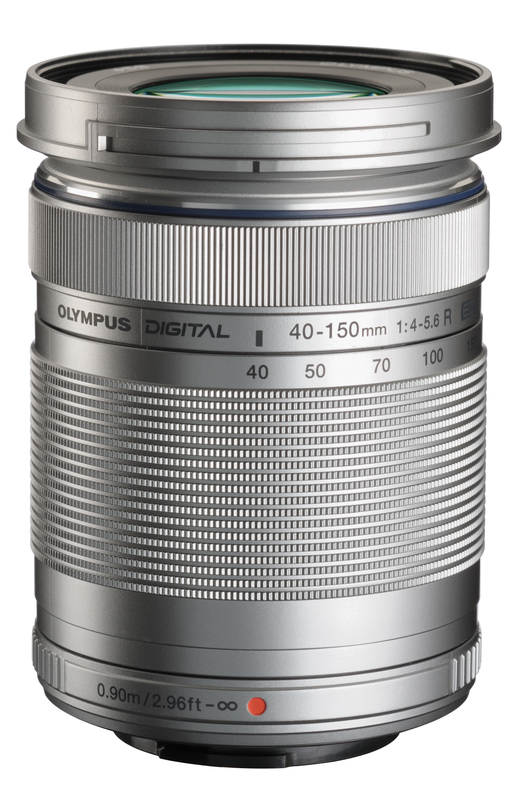 To ensure clear imaging performance even under unfavourable conditions such as when shooting against the light, the lens surfaces are coated with Olympus’s special ZERO (Zuiko Extra-low Reflection Optical) coating, which features high transmittance and the ability to completely eliminate previously hard-to-prevent artifacts such as ghosts and flares. The ZERO coating is an application of the thin film control technology we developed for microscopes. Development and production of such a lens is not possible without extensive expertise in the design phase, measurement techniques that can evaluate the surface accuracies correctly, advanced ultrahigh-precision aspherical formation technology, sophisticated polishing techniques and ultrahigh-precision assembly technology. 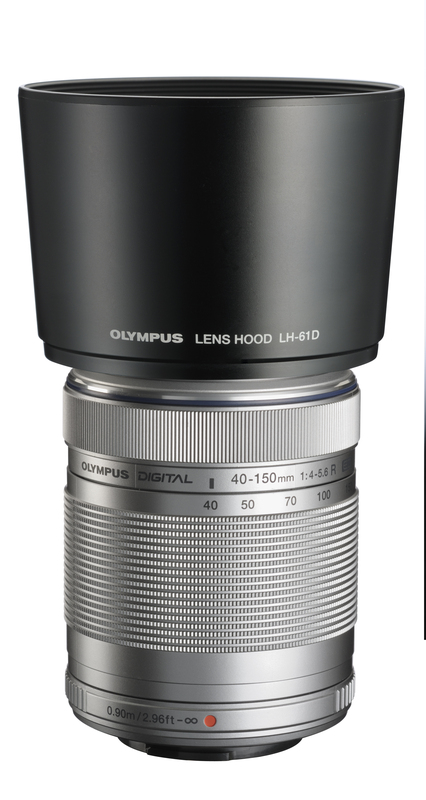 Only a manufacturer withOlympus’s expertise and experience could have created such a masterpiece of lens craftsmanship, fusing the essential elements from a wide range of advanced optical technologies into a powerful new lens that will set the standard for years to come. With previous wide-angle lenses, taking a picture in dimly lit conditions was virtually impossible without a tripod and flash. Thanks to its large aperture of f2.0 and wide angle of 24mm (35mm equivalent), the new M.ZUIKO DIGITAL ED 12mm f2.0 has expanded the range of low-light shooting in a big way. Combine that enhanced light-grabbing capability with the image stabilization mechanism built into PEN series cameras, and you’ve got a lens that serves up sharp, clear images in the dark without requiring a tripod or a flash. Besides typical low-light environments such as in the dusk or indoors, your camera is now able to shoot brilliant wide-angle pictures in locations where a tripod cannot be used such as busy tourist sites or crowded streets, as well as in locations where flash use is prohibited, such as zoos, museums, and aquariums. The fruit of advanced optical design technology, the MSC (Movie and Still Compatible) mechanism developed to enable fast, quiet autofocusing with a lightweight lens with a small number of lens elements. By driving the focusing lens directly using a metallic shaft and feed screw finished with precision in the sub-micrometric order, rather than using a gear, which is the cause of operating noise, the MSC ensures ultra-quite focusing. The inner focusing system that incorporates the MSC mechanism adjusts focusing by displacing only one small, lightweight lens element. This enables smooth autofocusing with high speed and low noise. The smooth autofocusing promises comfortable, stress-free shooting of movies as well as still images. This lens is a precision instrument and it looks like it. Though weighing just 130 grams, it exudes solidity and reliability, while its textured metallic finish expresses superior quality and performance. Designed to be appreciated and used for years to come, the lens represents the unification of “light”, “technology” and “mineral”. When combined with the OLYMPUS PEN E-P3 camera, which will be released simultaneously with the lens, the result is an exquisite tool, a work of art that transcends the limits of time. The new Snapshot Focus mechanism in the M.ZUIKO DIGITAL ED 12mm f2.0 is designed to allow the user to take snapshots that effectively capitalize of the characteristics of the wide-angle lens. With this mechanism, sliding the focus ring towards you moves the focusing point a specific distance, while rotating the focus ring moves the focal distance within the scale range indicated on the lens cylinder. When, for example, the camera’s mode dial is set to the A or M mode, the aperture to f8.0 and the focal distance to 3m, pan-focus shooting (in which both subject and background are focused) is possible, enabling fun, trouble-free snapshot shooting. PRF-D46PRO Protect FilterThis thin, ultra-light protect filter has a filter diameter of 46 mm and is treated with multi-coating. Picture: The New 12mm Zuiko. The M.ZUIKO DIGITAL 45mm f1.8 is a medium-telephoto single focal length lens with a focal length of 45mm (equivalent to 90mm of 35mm cameras) and a large aperture of f1.8 that has been specifically designed to make it easy for anyone to take advantage of the background defocusing technique of SLR photography. The combination of excellent lens performance in a light weight of mere 116g and prominent background defocusing is best for the portrait photographs of the family. Also incorporated is the MSC (Movie & Still Compatible) mechanism for fast, quiet autofocusing in both movie and still image shooting. A sophisticated metallic-style finish with high-grade texture and decoration ring gives this lens a clean, classic profile that exudes quality and performance. Large f1.8 aperture and optical design for soft defocusing proper to SLR cameras The M.ZUIKO DIGITAL 45mm f1.8 is a medium-telephoto, single focal length lens with a focal length of 45mm (equivalent to 90mm of 35mm cameras), developed to allow anyone to take advantage of the background defocusing. The brightness of the f1.8 aperture with a shallow depth of field makes it possible for anyone to shoot portrait pictures emphasizing the subject with soft, beautiful defocusing. The lightweight of mere 116g makes it possible to carry everywhere, anytime for occasions such as family events. To implement perfectly round defocusing, it is necessary to make the vignetting as small as possible, as well as to use a circular diaphragm. Vignetting is a phenomenon in which the defocusing in the image periphery area does not form a perfectly round shape but instead is elliptical like a rugby ball. This deformation occurs because the light incident to the peripheral area obliquely with respect to the optical axis is limited by the diameters of the lens elements before and after the diaphragm. With this lens, 8 groups of 9 lens elements, including two E-HR (Extra-High Refractive index) elements, are optimally laid out to ensure maximum image quality with high contrast and sharpness from the centre to the peripheral areas, thereby minimising vignetting. The optical design also helps eliminate ugly double-line defocusing caused by colour aberrations. Sophisticated metallic-style finish with high-grade texture and decoration ring for a classy, unified appearance Simple, yet sophisticated, the textured metallic-style finish gives this lens a clean, classic look that exudes quality and performance. Designed to complement any PEN series camera, this lens also features a decoration ring that can be used to conceal surface irregularities on the hood mount at the front of the lens and create a sense of unity and coherence. The inner focusing system that incorporates the MSC mechanism adjusts focusing by displacing only one group of two small, lightweight lens elements. This enables smooth autofocusing with high speed and low noise. The smooth autofocusing promises comfortable, stress-free shooting of movies as well as still images. The lens hood cuts unnecessary light from entering the lens during shooting against light and also offers effective lens protection. 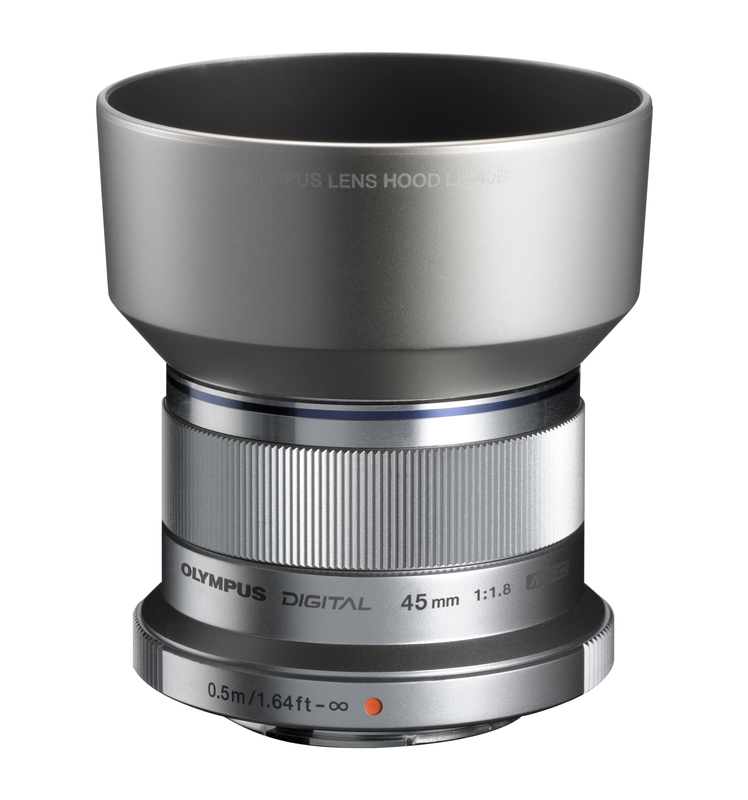 The LH-40B adopts a circular design and the same colour as the lens to match the high-grade texture of the lens. The decoration ring provided as a standard accessory is also available as an option. The decoration ring covers the irregularities on the hood mount at the front of the lens to improve the quality and sense of unity of the external view of the lens. 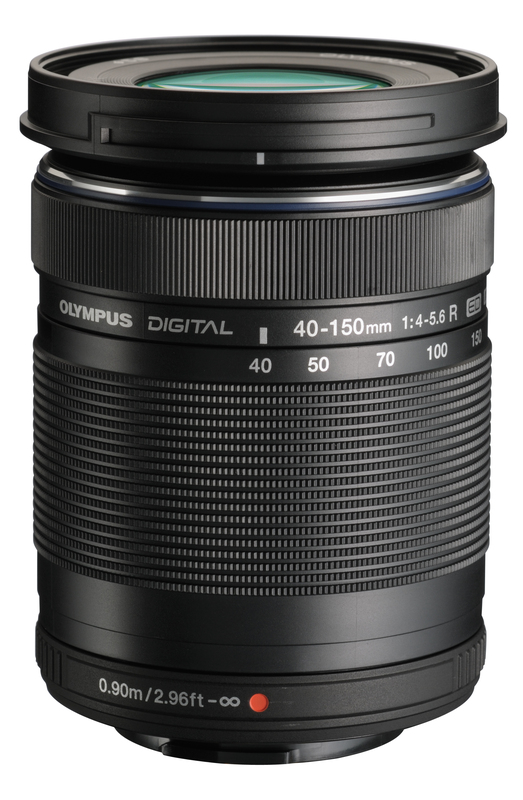 The DR-40 can be used with the M.ZUIKO DIGITAL 14-42mm f3.5-5.6 IIR and M.ZUIKO DIGITAL 14-42mm f3.5-5.6 II lenses as well as the M.ZUIKO DIGITAL 45mm f1.8 lens. Picture: The New 45mm Zuiko. 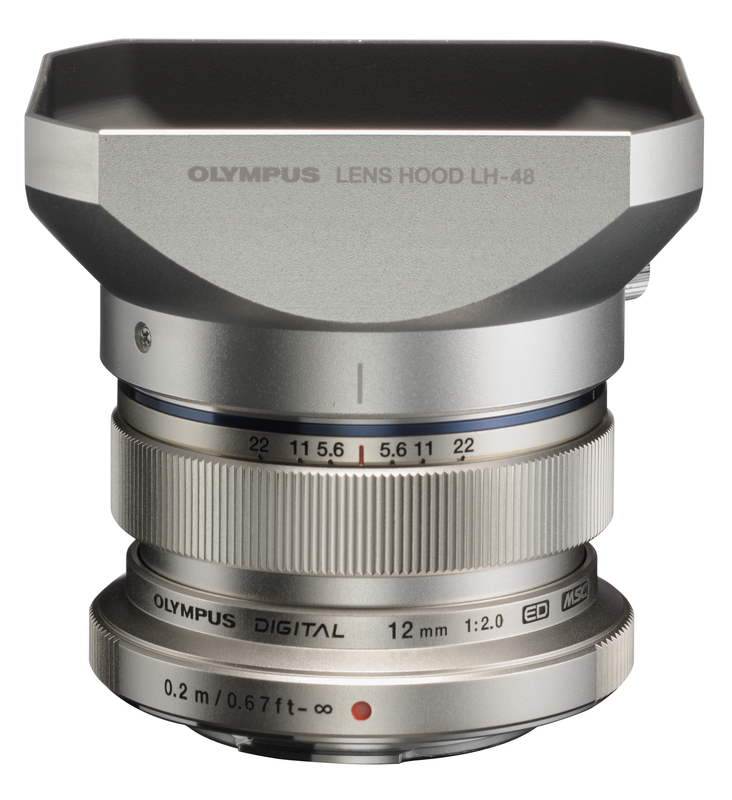 Picture: The New 45mm Zuiko with dedicated Hood. Picture: The New 40-150mm Zuiko with a Hat, I meant HOOD.